Looking for a powerful SUV that also offers comfort and convenience? Look no further than the Nissan Armada, a popular full-size SUV. Nissan trucks are known for their durability and longevity on the road, and this tradition continues with the Armada. Stop at Sheehy Nissan of Glen Burnie and check out the new Nissan Armada today. 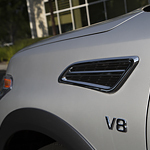 With the Nissan Armada, it’s all about power and performance. With a huge 5.6L, V8 engine, it’s not surprising the Armada provides a best-in-class in torque, horsepower and max towing capacity (8,500 lbs.) The automatic transmission offers not only seven speeds but also downshift rev and adaptive shift control, and idle neutral control. This results in a quieter engine at high speeds and more power with low speeds. The Nissan Armada provides excellent off-road capabilities as well, always giving the right amount of traction. If you’re in the market for a new pickup truck, come on to our Glen Burnie dealership and take the Armada out for a test drive.